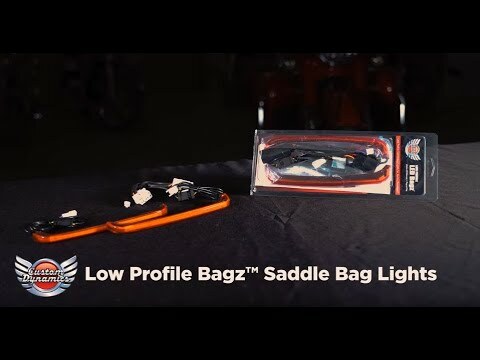 Low Profile BAGZ™ have been designed with a sleek low-profile design. Utilizing super bright red LEDs behind a red or smoked lens to provide contrasting red running light with full intensity brake light to the OEM Harley-Davidson® hard saddlebags. Low Profile BAGZ™ come pre-taped and include a plug and play wiring adapter for an effortless install. Lifetime LED warranty. Plug and Play on 1997-2013 Harley-Davidson® Electra Glide, Ultra Classic, Ultra Limited models (including CVO™), Road King (FLHR), and Road King Classic (FLHRC), 2006-2009 Street Glide (FLHX), 2003-2009 Road Glide Standard (FLTR), 2011-2013 Road Glide Ultra (FLTRU) and Road Glide Ultra CVO™ (FLTRUSE).